… “Ted why don’t you do something traditional” said the Doll. I was a bit perplexed as this is a country absolutely rammed full of traditions so what exactly did she mean … should I attend a Druid sacrifice at Stonehenge, do a bit of swearing on the horns, or try Morris dancing? Nope, turns out she simply meant that we should have afternoon tea. Afternoon tea started life squarely in the domain of the wealthy and upper classes. Anna, the seventh Duchess of Bedford, is credited with introducing afternoon tea into Britain around 1840. Ostensibly this was because she got hungry in the long stretch between luncheon at noon and dinner not kicking off until 8pm at the earliest in Victorian times. So around 4pm Anna would wheel out the teapot and a few nice sandwiches and cakes to see her through the next few hours. 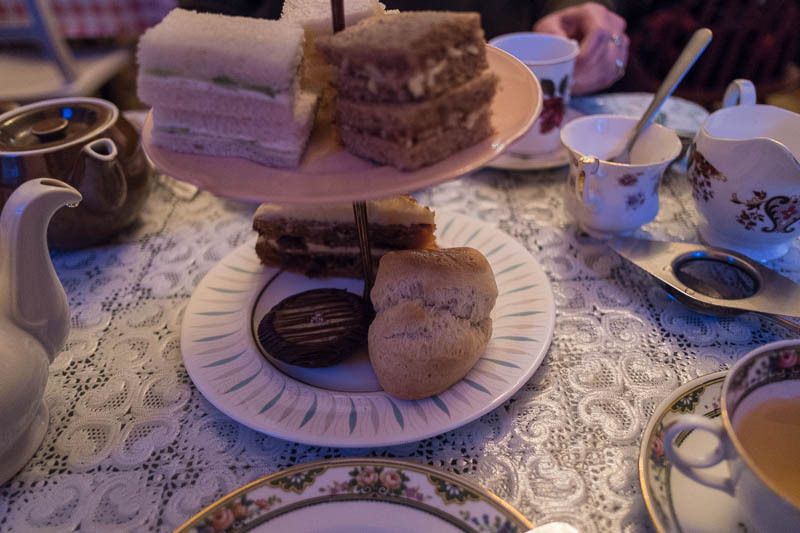 Pretty soon afternoon tea became a very fashionable event across the social spectrum, and of course it hasn't looked back since. Soho’s Secret Tearoom went wrong from the beginning. First the wrong tea arrived, and unable to get the waitresses attention no matter what I did, I had to take it back to the counter myself. When after 30 minutes the food still hadn't arrived the Doll went to the counter. The food then quickly arrived on a lovely tiered cake plate – the wrong cake. The advertised sandwich selection of cucumber, egg and cress, and cream cheese and chives turned out to be cucumber and cream cheese, egg without a sign of cress, and cheese and pickle. The scone was rather misshapen but tasted ok with jam and clotted cream but the carrot cake was just too undercooked to be enjoyable. By this time I realised that it had all gone so horribly wrong that it was actually a quite entertaining comedy of errors. I was warm and comfortable, had nowhere else to be in any particular hurry, and it was nice to be drinking tea from a teapot as opposed to dunking a bag into a cup. So hence I am only "sort of" ignoring the guidelines. 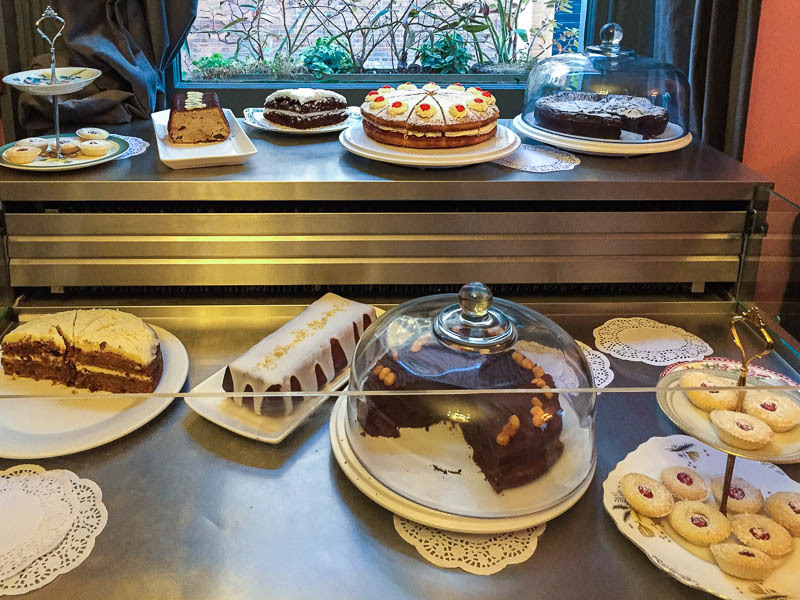 However … the Secret Tearoom owes it to itself to live up to its potential – especially as it’s right next door to the venerable Maison Bertaux, where they know how to do it right. Let's have some of those sweets! Too bad the place had trouble getting thing organized. It does look very charming. Oh well, you'll just have to find another spot for afternoon tea! I'm sorry that this tea room didn't work out for you. Maybe they just had a bad day.